“From the first rough designs in the late eighteenth century to today’s transformers, these machines have been crucial in the generation, transmission and distribution of electricity. In 1886 Stanley and Westinghouse demonstrated the advantages of distribution systems with two types of transformers: step-up and step-down transformers. This gave rise to heated disputes in the United States between the supporters of Westinghouse’s alternating current distribution and those of Edison’s direct current system, the results of which are well known to us today. In 1890 Dolivo-Dobrowolsky, an AEG engineer, perfected the transformer to more or less how we know it today by inventing the three-phase transformer, and that same year Brown (founder of Brown-Boveri) built the first oil-immersed transformer. The transformer has been at our service for over 120 years now and during this time there have been major technical developments in design and maintenance, as well as the need for diagnosis mainly due to the evaluation of the electricity market. Therefore, items such as prolonging the transformer’s service life, increasing the electrical charge and reducing maintenance are subject to ongoing research. Today, to ensure a continual supply of electricity a fleet of efficient and reliable transformers is required. If the fleet should not be totally reliable, this could give rise to major social, environmental and economic impacts. For this same reason electricity companies have such severe maintenance policies. The situation is further aggravated by the fact that the world’s transformers are aging. Many electricity companies in Europe and North America have a large number of transformers that have been in service for over 30 years, often exceeding the lifetime for which they were designed. •	High dielectric rigidity to withstand the stress caused by the service. •	Low viscosity enabling the oil to flow and to transfer heat. •	Appropriate properties at low temperatures, below the lowest expected temperature at the installation site. •	Resistance to oxidation to maximise service life. In service, mineral oil loses its properties due to the conditions of use. In many situations, the oil is in contact and, therefore, subjected to oxidation. Higher temperatures also accelerate the degradation. The presence of metals, organometallic compounds, or both can catalyze oxidation. There may be changes in colour, formation of acidic compounds and in advanced stages of oxidation, precipitation of silt. Thus affecting the oils properties, deteriorating its dielectric properties and, in extreme cases, the thermal properties as well. With regards to the above, it is obvious that an efficient transformer fleet requires a proper predictive maintenance policy. With these maintenance programmes the aim is to know the general condition of the equipment and determine the existence of faults in order to anticipate possible failure and programme regular maintenance of the transformer or its replacement. 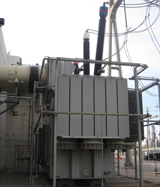 The analyses and tests related to predictive maintenance of transformers can be classified into three groups. These analyses determine the oil condition, detect signs of contamination and assess the degree of aging, factors that have a decisive effect on the dielectric and cooling properties of the oil. The first test refers to the physical-chemical analysis of the oil. The second set of tests requires chromatographic techniques: by chromatographically analysing the gases, possible defects are tracked, and as far as possible emerging faults in the transformer are catalogued. The last set of tests is carried out “”in situ”” on the transformer itself, confirming and, where possible, identifying possible faults using analytical techniques on the oil. The results of the various tests are decisive factors with regards to the operation and maintenance of the transformers. ceis, a Laboratory of Electrotechnical Material operates in this field, having worked in the electricity sector for over 20 years. The Laboratory of Dielectric Material is made up of a team of 8 people, with the aim to diagnose and analyse the behaviour of insulating materials in electrical equipment, mainly transformers, using physical, chemical and electrical tests. ceis works closely with various companies within the electricity industry: manufacturers, consumers and universities, in areas of daily work and in the commissioning of research, development, innovation, training and technology consultancy with regards to transformer diagnosis, indications of aging and loss of service lifetime of the materials. The Laboratory of Dielectric Materials has excellent facilities equipped with high-performance instruments as well as an Electrical Laboratory for carrying out the various tests requiring a voltage level of up to 100kV. Accredited by ENAC according to the UNE-EN-ISO 17025 Standard, the laboratory regularly participates and collaborates with the Committees and Working Groups of the International Association CIGRE and the Technical Committee of Standardisation of Insulating Fluids, AEN / CTN 207 SC10. The analyses and tests that are undertaken in the Laboratory of Dielectric Materials are fully within predictive maintenance programmes developed by the companies to whom these services are aimed. All analyses are based on the evaluation standards of mineral oils in service, incorporating in this diagnosis all the information and experience accumulated during our 20 years of service in the industry. Not surprisingly, the laboratory now has a database with more than 300,000 records from as many analyses carried out on an extremely large number of transformers. This extensive database provides additional information with which to compare, and if necessary clarify the diagnosis of the status of a transformer, thus issuing reports with a greater degree of assurance. As already mentioned, the first stage of predictive maintenance is based on the physical-chemical and chromatographic tests performed on samples of transformer oil. Depending on the type of equipment, the oil or the additives, certain tests are generally recommended and these are usually grouped as follows: basic, supplementary and special. During the service life of the oil, in addition to oxidation products, the oil may accumulate many other undesirable contaminants such as water, solid particles or soluble polar compounds affecting its electrical properties. The presence of these contaminants and any other oil degradation product is evidenced by the change of one or more of the properties indicated in the table below. The analysis of free and dissolved gases is one of the diagnostic tools most widely used to detect and evaluate faults in electrical equipment. However, the interpretation of the results is often complex and must be done carefully by personnel experienced in maintenance. Development of a simplified model to estimate the aging of transformers based on the concentration of furan compounds in the oil. In this aspect, for example, there is no reference standard with regards to the evaluation of the results of 2-furfuraldehyde and related compounds, although there are numerous technical articles on the interpretation of results. For this reason, at the Laboratory we are currently working on improving mathematical models and carrying out a statistical analysis of the database, to improve diagnosis. The degree of aging of a transformer is linked to the degree of aging of the solid insulation. Aging of the insulating paper of a transformer is determined by the degree of polymerization of the cellulose, as this parameter is directly correlated with the tensile strength of the paper and, therefore, the capacity of the transformer to support dynamic forces of a short circuit. It is well known that the aging process of the insulating papers generate furan compounds, of which the main one is 2-furfuraldehyde (2FAL), thus the analysis of furan compounds can be used to estimate the degree of aging of the insulating paper . Several models to estimate the aging of a transformer’s cellulosic paper and even neural networks which estimate the degree of relative aging can be found in the various scientific text books available. Amongst the books consulted, Cheim’s model  deserves a special mention. Cheim’s model takes into account that in a transformer there is a thermal gradient along the height of the coil and along the insulation thickness (from the paper layer which touches the copper to the paper layer in contact with the oil). The model estimates the production of furfural from each differential element of paper and integrates it to obtain the furfural content in the oil. Finally it comes to an approximate expression which relates the concentration of 2FAL with the estimated degree of polymerization for the hottest point. However, the production of 2FAL not only depends on the degree of polymerization of the paper but also on other factors, such as oxygen and water content. For this reason we at ceis are promoting the development of a model similar to that described but with the addition of other variables related to the aging of the cellulose and our experience in this field. We hope that we can soon incorporate the findings of this study into our diagnostic methods, which we are sure will help determine more accurately the general condition of the transformers as well as improve predictive maintenance techniques employed to date.